VALLEY PARK, Mo. (CNS) — At about 8:30 on a chilly morning Dec. 30, Mickey Downing of the Valley Park Fire District went house to house in lower Valley Park, knocked on doors and asked people to evacuate for their safety with the Meramec River nearing the top of the levee protecting the small town. The levee gate was built to withstand a crest of 42 feet and 6 inches, a foot lower than the Army Corps of Engineers predicted crest of 43 feet and 6 inches between midnight of that day and 6 a.m. Dec. 31. The levee itself could withstand a 44-foot crest. The record crest was 39, set in 1982. Most of Downing’s knocks in the community 20 miles southwest of St. Louis went unanswered, which was good news — residents already had sought higher ground. Most of the few who answered were packed and ready to leave. A few diehards were staying behind, hoping to stay dry. However, Dixie Freeman was neither a diehard nor an evacuee. 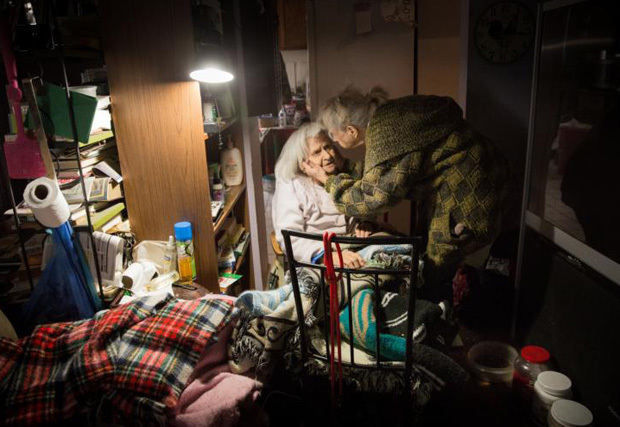 She was stranded, with her disabled 94-year-old mother, a couple of dogs and a cockatiel. 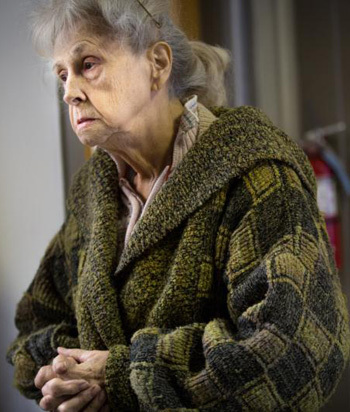 She also was cold, shivering in the 33-degree air as she approached Downing a couple of blocks from her home. She wore lightweight pants and a green knitted sweater. “Can you help?” she asked Downing. He quickly learned how dire her situation. She had no phone, no way to communicate with anyone, and a broken-down car. A son was expected to get her, but his arrival was uncertain because of flooding and road closures in his area. Freeman, her mother Nora Dell, dogs Rocky and Fifi, and the cockatiel were stuck. “I am recommending you go to City Hall for transportation and then go to (Sacred Heart) Church as a shelter, especially since you don’t have wheels to get out,” he said. A couple of bystanders volunteered to take Freeman, her mother and the pets to City Hall, where buses were waiting to evacuate residents. After a few phone calls and help from city workers, bus driver Tamekia Davis drove Freeman to her home, where Rocky and Fifi scampered about as she gathered belongings in a couple of suitcases and grocery bags. However, Nora didn’t want to leave. A diabetic, she is partially deaf. She is also blind and uses a walker or a wheelchair. “What are you doing with me? What are you doing with me?” she asked, repeatedly. Freeman assured her that everything was all right, that they had to leave for their safety. Freeman again faced the prospect of losing everything, as happened in the 1982 flood. Ultimately, Nora agreed to leave, but she pleaded to bring her dog. “I want my Rocky. I want my Rocky,” she said. A veterinarian came for the cockatiel, Downing came by with a couple of other firefighters, and Davis got everyone, including Rocky and Fifi, on the bus for the one-mile ride to Sacred Heart Church. There, pastor Father Denny Schaab greeted them with open arms. Vehicles from lower Valley Park, including U.S. Postal Service trucks and vans from a food pantry, already filled the parking. In an agreement with Fire Chief Rick Wilken, a parishioner, Father Denny opened the church basement for a shelter, as the parish had done during previous floods. But there was a hitch because the Red Cross had not yet arrived to coordinate efforts even as parishioners steadily called to volunteer to help. Father Schaab worked his smartphone and discovered that the Red Cross was shifting the shelter to another church because the flood waters threatened the parish site. Davis reloaded the bus with Freeman and her crew and off they went again — hopefully to eventually return to a dry home but with uncertainty hanging over their heads. “We pray for the best,” Father Schaab said, watching them drive away. 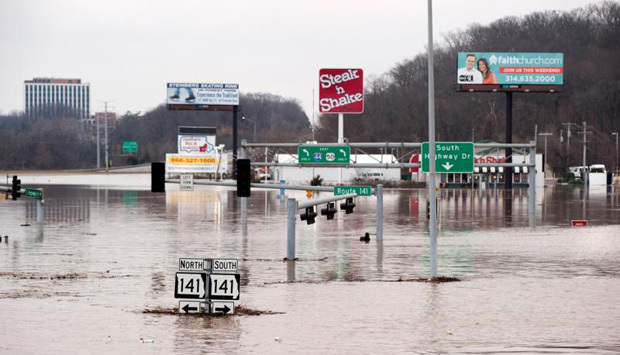 Elsewhere, parishes in areas of the St. Louis Archdiocese affected by flooding responded to people in need and made plans for a coordinated community response. “Keep us in your prayers,” said Pam Manuel, parish secretary at St. Bridget of Kildare Parish in Pacific, 35 miles southwest of St. Louis. The parish is allowing people affected by the flooded Meramec River to leave their vehicles and boats in its parking lot, which overlooks the low-lying, water-soaked southern end of the city. Calls came from people seeking housing and while housing options are limited, the Society of St. Vincent de Paul conference at the parish is assisting displaced residents. Manual is president of the Pacific Lions Club, which has received a grant from Lions Club International to purchase food, water, mops, buckets, gloves and “pretty much anything people will need to get their homes cleaned up,” she said. Most Sacred Heart Parish in Eureka, not far from St. Bridget, also worked on plans to respond Dec. 30. The former head of the parish’s Society of St. Vincent de Paul conference, who has experience from two previous floods, was among those being consulted. The parish gym was being considered as a place for programs, according to parish staff. Staff at Immaculate Heart of Mary Parish in south St. Louis were glad that sandbagging of the River des Peres was completed, but they remained on edge in case the water tops the levee. The parish buildings were a possible source of shelter in a community response. Parishioners were among the volunteers in the sandbagging effort. St. Mark Parish in nearby suburban Affton had some water damage in the chapel of its school. The Arnold Food Pantry, which has worked with Immaculate Conception Parish in Arnold and volunteers from nearby St. David Parish, assisted flood victims in northern Jefferson County. Leucking is a reporter at the St. Louis Review, newspaper of the Archdiocese of St. Louis. Joseph Kenny of the St. Louis Review staff contributed to this report.